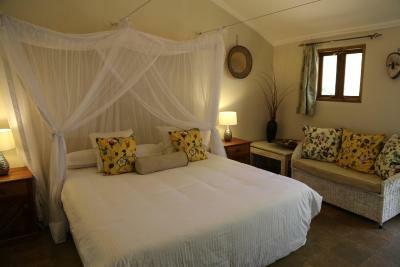 Lock in a great price for Wildebeest Eco Camp – rated 8.4 by recent guests! The staff is very professional, food was awesome. Loved the environment. 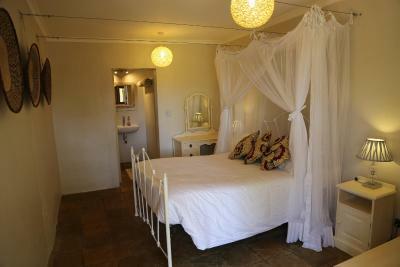 Good kitchen, clean bathrooms, clean beds, friendly staff. 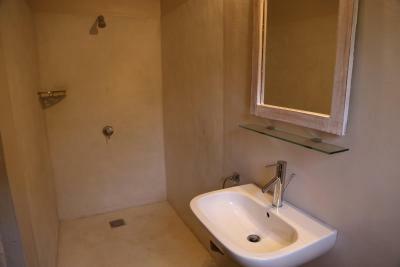 The area is nice and clean and very eco friendly. Lots of green space to sit down and read a book, or just enjoy the surrounding nature on the outskirts of the bustling city of Nairobi. The tents, bathrooms and facilities were nice. Staff were friendly and professional. Food was amazing! The place is absolutely beautiful and the food was delicious. The staff was particularly helpful. My flight was delayed and so I checked in late, but the late-shift person at reception was very accommodating. The airline had lost my luggage and she repeatedly called the airline on my behalf until my luggage was returned. Overall, after visiting four countries in Africa, my time at Wildebeest Eco Camp was the best. 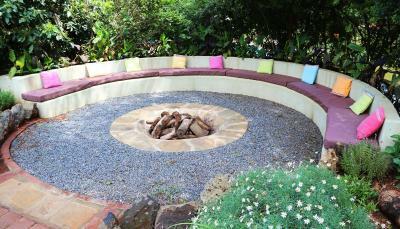 calm surroundings and very relaxing oasis in Nairobi. 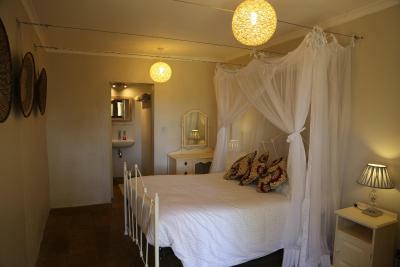 Staff were very friendly and helpful and you always felt safe and relaxed during the stay. Can absolute recommend to stay here. 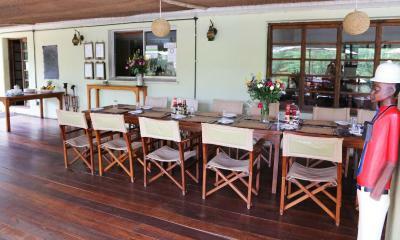 Beautiful property and garden, nice staff and good food. Really special place close to the city. 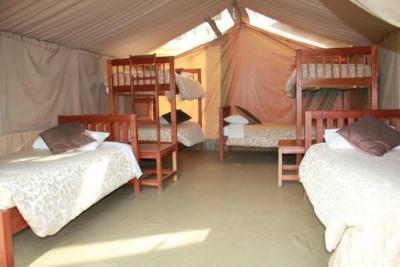 Clean tents and good beds. Good atmosphere. 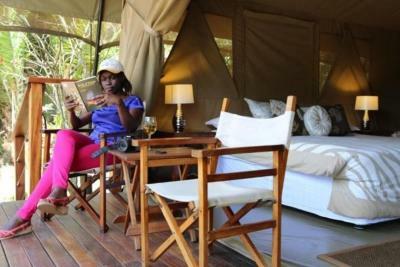 Wildebeest Eco Camp This rating is a reflection of how the property compares to the industry standard when it comes to price, facilities and services available. It's based on a self-evaluation by the property. Use this rating to help choose your stay! 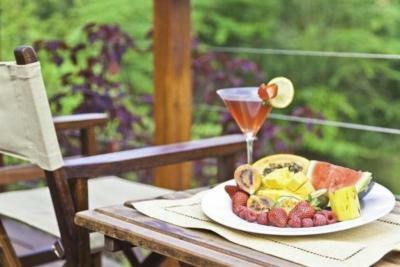 Located in Nairobi, Wildebeest Eco Camp offers accommodations with free WiFi and access to a garden. Breakfast is available daily, and includes continental, Full English/Irish and American options. 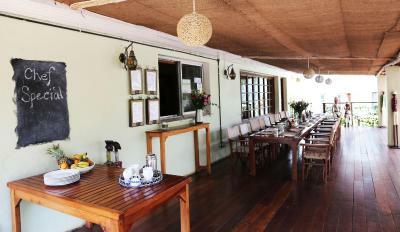 There is an on-site restaurant, which serves a variety of African dishes. 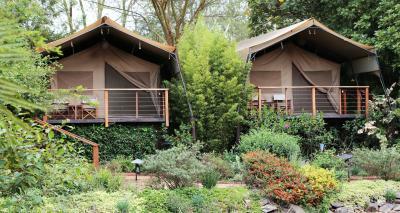 The tented camp offers a year-round outdoor pool. 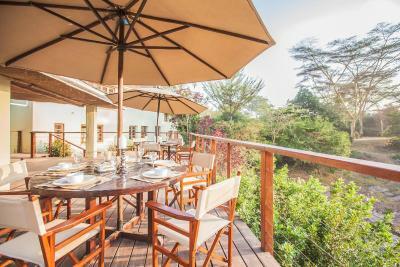 A children's playground and a sun terrace are available for guests at Wildebeest Eco Camp to use. Kenyatta International Conference Center is 5.6 mi from the accommodations, while Nairobi National Museum is 5.6 mi away. 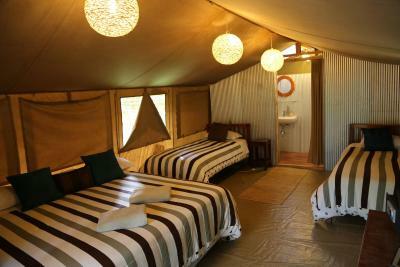 When would you like to stay at Wildebeest Eco Camp? 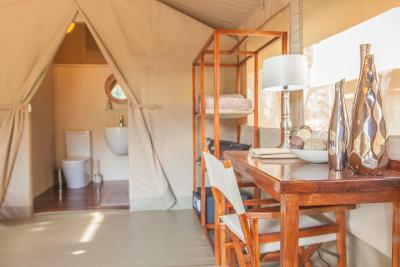 These spacious and luxurious canvas tents are equipped with all the expected modern conveniences, including an private bathroom with solar-hot shower, basin and flush toilet, – as well as 240v electricity. This tent has a private entrance and enjoys garden views. Bed in mixed dormitory room with bunk beds and access to a shared bathroom. 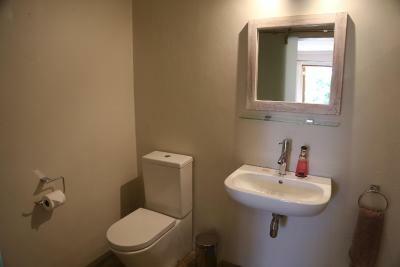 This room has a private entrance and enjoys garden views. This family room has a balcony and a seating area.. 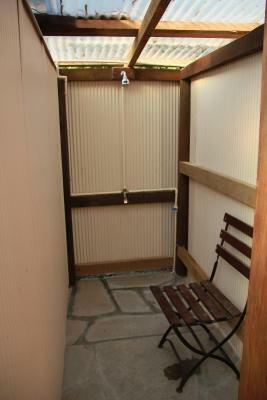 This room has a private entrance and enjoys garden views. 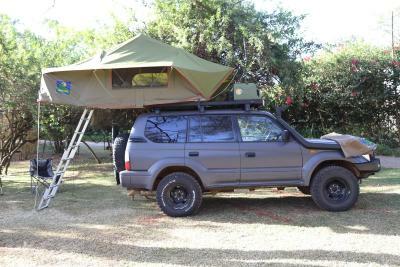 This basic tent allows for private sleeping space, plus modern comforts including electricity, bedside lamps, and a safe. 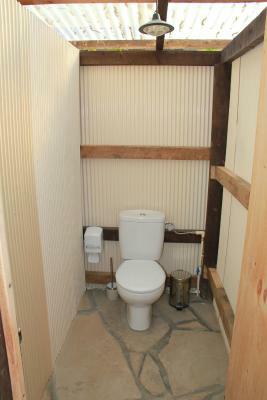 The tents have access to a shared bathroom with solar hot shower, toilet and basin. 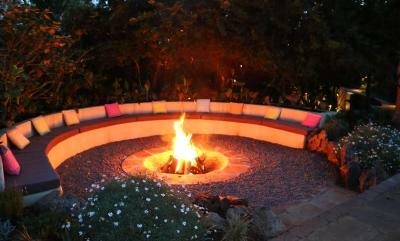 This tent has a private entrance and enjoys garden views. 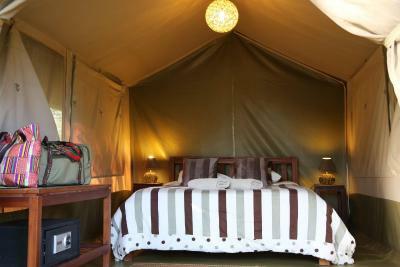 This tent has a private entrance and enjoys garden views. 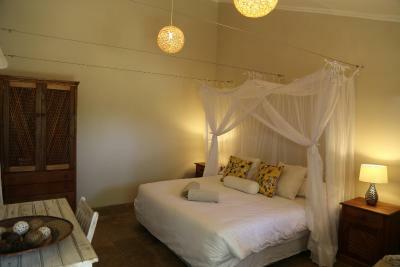 These comfortable rooms offer views of the garden, closet space and a seating area with coffee table. 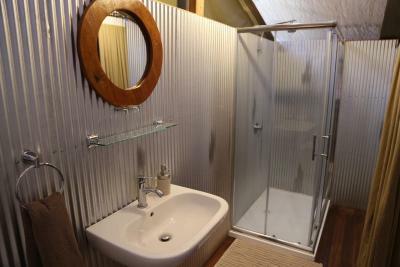 The room has a small kitchenette fitted with a fridge. This tent has a private entrance. 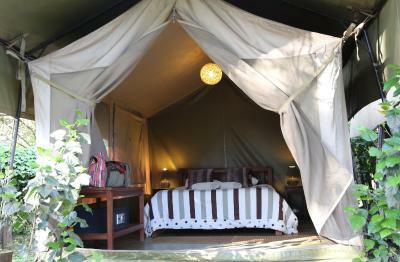 Wildebeest Eco Camp is the ideal base in Nairobi where guests can experience a genuine ‘under canvas’ experience, from the time they land in Kenya. 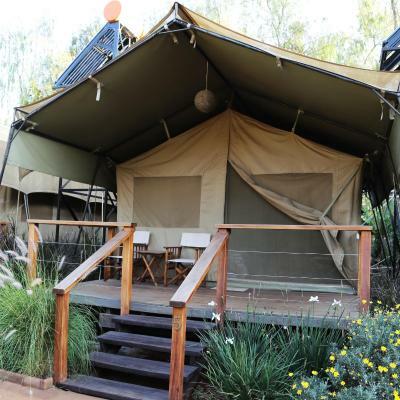 A welcome change from a ‘regular city hotel’, the camp is an ideal choice, whether transiting on a safari or looking for a base for a city break, long-stay, family holiday, volunteering or business trip. 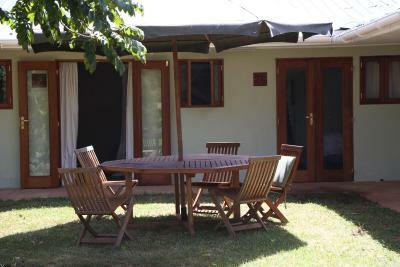 The camp is set in 3.5 acres of beautiful gardens, shaded by large acacia trees, around eight kilometres from the city centre in the leafy suburb of Karen (named after Danish author Karen Blixen). Here, it is possible to enjoy the best of both worlds – being away from the hustle and bustle of the city, while being conveniently close to major tourist attractions and essential amenities like ATMs, bank, supermarket, chemist, as well as a host of places to eat and socialise. 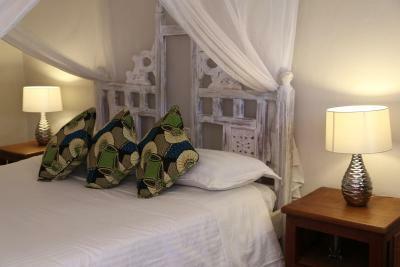 There are good transport links to the city centre, as well as both the domestic and international airports, and major roads leaving the city for safari destinations. The camp is a hub for travellers, creating a homely and friendly atmosphere to meet other guests, for families to relax, catch up on work, or just enjoy your break. A true ‘home away from home'. 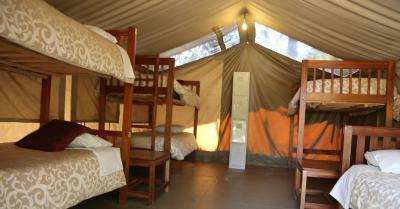 House Rules Wildebeest Eco Camp takes special requests – add in the next step! 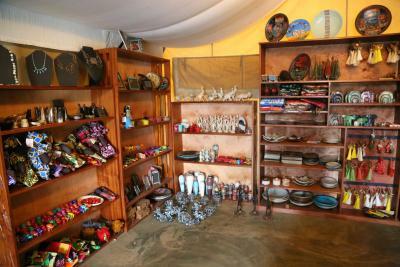 Wildebeest Eco Camp accepts these cards and reserves the right to temporarily hold an amount prior to arrival. There was a problem with one of the bathrooms, so I had to use facilities further from my tent. There were occasional problems with WiFi. Although the location felt remote I could hear the nearby bypass at night. The reception staff were particularly friendly, but the owners more or less ignored me. 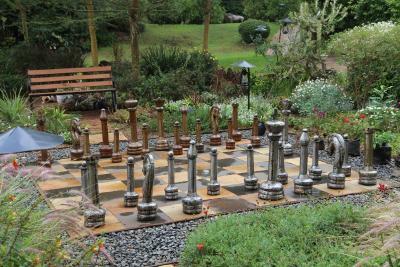 The setting was lovely, with lots of lush gardens and some wildlife (fish, birds and occasional monkey). 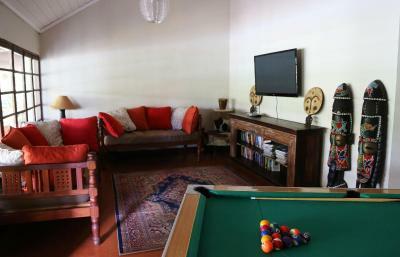 The food was good, and there was a tv/games room and pool, as well as plenty of seating areas to relax. The staff were very friendly. 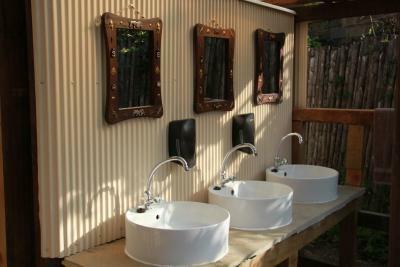 The stopper in the handwash basin in the bathroom in luxury tent no:4 is broken. Even realizing the drought situation in Kenya, the lake/pond could do with a little more water, but understand if water usage is restricted by the Nairobi waterboarding! Really nothing more! To much to comment, such to say this is our 4th visit to Wildebeest and it is very enjoyable every time! Without the upgrade we got as were initially very disappointed with accomm. As only a bed and table in tent. Which was very poor value for money. Read small print. The pool.and loved the environmental policies and efforts to be green with eco fittings from waste to ligting . Also loved the naturelness of birds and monkeys. Perfect location , friendly staff . Peace and tranquillity. Lovely, peaceful oasis away from the city. I started to unwind as soon as I arrived. A wonderful place to disconnect. There were some facilities that would have made it that much more fun for my daughter and I- like the zip line being fixed, the Fuzeball table fixed, the snooker table (I saw at least 4 patties wanting to play pool but the cues were broken, balls missing and the table itself dodgy). And that trampoline in the photo? It's in a private back yard. These things were in the photos, whIch sets up a certain expectation, and I see a false advertising. Come on owner- easy things to fix showing attention to detail. Wi-fi not in rooms?? Avail. Could be heavier. Fruits & Cereal should be included. Slight concern with a few holes in the tent door (mozzie net) though there were very few mozzie around. 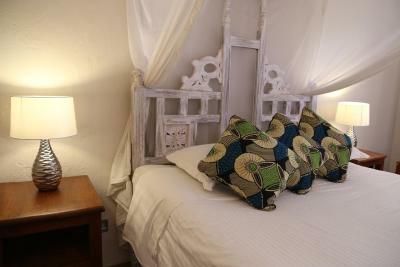 Lovely comfy rooms, beautiful and peaceful environment with lots of birds to start off your wildlife spotting in Kenya. Friendly staff. The evening buffet was delicious and varied, and breakfast offered plenty of choice. 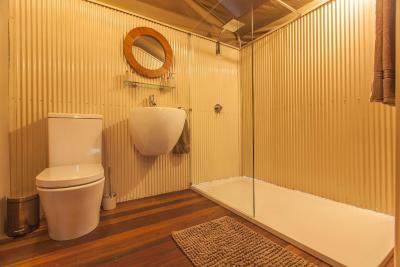 Really clean facilities both in the rooms and in the camping wash areas. Could have been advised when leaving for elephant sanctuary that it doesn't open until 11 but not really their fault! Arrived in the dark and left in the morning so didn't have too much time but the experience was overall great. Breakfast was delicious but no spinach available which was a shame!